Stephen Gary "Woz" Wozniak (/ˈwɒzniæk/; born August 11, 1950),(p18)(p27) is an American inventor, electronics engineer, programmer, philanthropist, and technology entrepreneur who in 1976 co-founded Apple Inc., which later became the world's largest information technology company by revenue and largest company in the world by market capitalization. He and Apple co-founder Steve Jobs are widely recognized as pioneers of the personal computer revolution of the 1970s and 1980s. In 1975, Wozniak started developing the Apple I(p150) into the computer that launched Apple when he and Jobs first began marketing it the following year. He primarily designed the Apple II in 1977, known as one of the first highly successful mass-produced microcomputers, while Jobs oversaw the development of its foam-molded plastic case and early Apple employee Rod Holt developed the switching power supply. 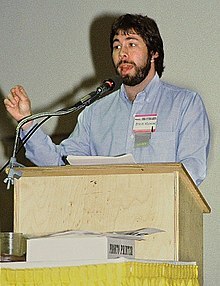 With computer scientist Jef Raskin, Wozniak had major influence over the initial development of the original Apple Macintosh concepts from 1979 to 1981, when Jobs took over the project following Wozniak's brief departure from the company due to a traumatic airplane accident. After permanently leaving Apple in 1985, Wozniak founded CL 9 and created the first programmable universal remote, released in 1987. He then pursued several other business and philanthropic ventures throughout his career, focusing largely on technology in K–12 schools. Wozniak is currently Chief Scientist at the data virtualization company Primary Data, and has remained an employee of Apple in a ceremonial capacity. Steve Wozniak was born in San Jose, California, the son of Francis Jacob "Jerry" Wozniak (1925–1994) from Michigan(p18) and Margaret Louise Wozniak (née Kern) (1923–2014) from Washington state. (p18) He graduated from Homestead High School in 1968. The name on Wozniak's birth certificate is "Stephan Gary Wozniak", but Steve's mother said that she intended it to be spelled "Stephen", which is what he uses. (p18) Wozniak has mentioned his surname being Polish and Ukrainian and spoken of his Polish descent,(pp129–130) but stated that he does not know the origin of some other people with the Wozniak surname because he is "no heritage expert". In the early 1970s, Wozniak was known as "Berkeley Blue" in the phone phreak community, after he made a blue box. Wozniak has credited watching Star Trek and attending Star Trek conventions while in his youth as a source of inspiration for his starting Apple Inc. In 1969, Wozniak returned to the Bay Area after being expelled from University of Colorado Boulder in his first year for sending prank messages on the university's computer system. During this time, as a self-taught project, Wozniak designed and built a "Cream Soda" computer with his friend Bill Fernandez. He later re-enrolled at De Anza College and transferred to University of California, Berkeley in 1971. Before focusing his attention on Apple, he was employed at Hewlett-Packard (HP) where he designed calculators. It was during this time that he befriended Steve Jobs. "We first met in 1971 during my college years, while he was in high school. A friend said, 'you should meet Steve Jobs because he likes electronics, and he also plays pranks.' So he introduced us." In 1976, Wozniak completed the Apple I design. He alone designed the hardware, circuit board designs, and operating system for the computer. Wozniak originally offered the design to HP while working there, but was denied by the company on five different occasions. Jobs instead had the idea to sell the Apple I with Wozniak as a fully assembled printed circuit board. Wozniak, at first skeptical, was later convinced by Jobs that even if they were not successful they could at least say to their grandkids they had had their own company. Together they sold some of their possessions (such as Wozniak's HP scientific calculator and Jobs's Volkswagen van), raised $1,300, and assembled the first boards in Jobs's bedroom and later (when there was no space left) in Jobs's garage. Wozniak's apartment in San Jose was filled with monitors, electronic devices, and some computer games Wozniak had developed. The Apple I sold for $666.66. (Wozniak later said he had no idea about the relation between the number and the mark of the beast, and "I came up with [it] because I like repeating digits.") 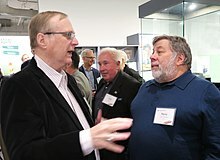 Jobs and Wozniak sold their first 50 system boards to Paul Terrell, who was starting a new computer shop, called the Byte Shop, in Mountain View, California. On April 1, 1976, Jobs and Wozniak formed Apple Computer (now called Apple Inc.) along with administrative supervisor Ronald Wayne, whose participation in the new venture was short lived. Wozniak resigned from his job at Hewlett-Packard and became the vice president in charge of research and development at Apple. He and Jobs decided on the name "Apple" shortly after Jobs returned from an apple orchard in Oregon. Wozniak's Apple I was similar to the Altair 8800, the first commercially available microcomputer, except the Apple I had no provision for internal expansion cards. With expansion cards the Altair could attach to a computer terminal and be programmed in BASIC. In contrast, the Apple I was a hobbyist machine. Wozniak's design included a $25 microprocessor (MOS 6502) on a single circuit board with 256 bytes of ROM, 4K or 8K bytes of RAM, and a 40-character by 24-row display controller. Apple's first computer lacked a case, power supply, keyboard, and display, all components the user had to provide. In 1980, Apple went public to instant and significant financial profitability, making Jobs and Wozniak both millionaires. The Apple II's eventual successor, the Apple III, released the same year, was not nearly as successful as the Apple II. According to Wozniak, the Apple III "had 100 percent hardware failures", and that the primary reason for these failures was that the system was designed by Apple's marketing department, unlike Apple's previous engineering-driven projects. During the early design and development phase of the Macintosh 128K, Wozniak had heavy influence over the project until 1981. In a 2013 interview, Wozniak said that "Steve [Jobs] really took over the project when I had a plane crash and wasn't there." Wozniak did not immediately return to Apple after recovering from the airplane crash, seeing it as a good reason to leave. 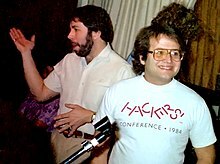 In May 1982 and 1983, Wozniak, with help from professional concert promoter Bill Graham, founded and sponsored two US Festivals to celebrate evolving technologies; they ended up as a technology exposition and a rock festival as a combination of music, computers, television and people. After losing several million dollars on the 1982 festival, he stated that unless the 1983 event turned a profit, he would end his involvement with rock festivals and get back to designing computers. Later that year, Wozniak returned to Apple product development, desiring no more of a role than that of an engineer and a motivational factor for the Apple workforce. In the mid-1980s he designed the Apple Desktop Bus, a proprietary bit-serial peripheral bus introduced on many later Macintosh and NeXT computer models. However, even with the success he helped create at Apple, Wozniak believed that the company was hindering him from being who he wanted to be, and that it was "the bane of his existence". He enjoyed engineering, not management, and said that he missed "the fun of the early days". Although its products provided about 85% of Apple's sales in early 1985, the company's January 1985 annual meeting did not mention the Apple II division or employees, a move that frustrated Wozniak. As other engineers joined the growing company, he no longer believed he was needed there and by early 1985, Wozniak left Apple again, stating that the company had "been going in the wrong direction for the last five years". He then sold most of his stock. One thing Wozniak wanted to do was teach elementary school because of the important role teachers play in students' lives. Eventually, he did teach computer classes to children from the fifth through ninth grades and teachers as well. Wozniak founded CL 9 in 1985, which developed and brought the first programmable universal remote control to market in 1987. In 2001, Wozniak founded Wheels of Zeus (WOZ), to create wireless GPS technology to "help everyday people find everyday things much more easily". In 2002, he joined the board of directors of Ripcord Networks, Inc., joining Apple alumni Ellen Hancock, Gil Amelio, Mike Connor, and Wheels of Zeus co-founder Alex Fielding, in a new telecommunications venture. Later the same year he joined the board of directors of Danger, Inc., the maker of the Hip Top. Though finally leaving Apple as an active employee in 1985, Wozniak chose to never remove himself from the official employee list, and continues to represent the company at events or in interviews. Today he receives a stipend from Apple for this role, estimated to be $120,000 per year. He is also an Apple shareholder. He maintained a friendly acquaintance with Steve Jobs until Jobs's death in October 2011. However, in 2006, Wozniak stated that he and Jobs were not as close as they used to be. In a 2013 interview, Wozniak said that the original Macintosh "failed" under Steve Jobs, and that it was not until Jobs left that it became a success. He called the Apple Lisa group the team that had kicked Jobs out, and that Jobs liked to call the Lisa group "idiots for making [the Lisa computer] too expensive". To compete with the Lisa, Jobs and his new team produced a cheaper computer, one that, according to Wozniak, was "weak", "lousy" and "still at a fairly high price". "He made it by cutting the RAM down, by forcing you to swap disks here and there", says Wozniak. He attributed the eventual success of the Macintosh to people like John Sculley "who worked to build a Macintosh market when the Apple II went away". Silicon Valley Comic Con (SVCC) is an annual pop culture and technology convention at the San Jose McEnery Convention Center in San Jose, California. The convention was co-founded by Wozniak and Rick White, with Trip Hunter as CEO. Wozniak announced the annual event in 2015 along with Marvel legend Stan Lee. US Patent No. 4,136,359: "Microcomputer for use with video display"—for which he was inducted into the National Inventors Hall of Fame. US Patent No. 4,210,959: "Controller for magnetic disc, recorder, or the like"
US Patent No. 4,217,604: "Apparatus for digitally controlling PAL color display"
US Patent No. 4,278,972: "Digitally-controlled color signal generation means for use with display"
In 1990, Wozniak helped found the Electronic Frontier Foundation, providing some of the organization's initial funding and serving on its founding Board of Directors. He was the founding sponsor of the Tech Museum, Silicon Valley Ballet and Children's Discovery Museum of San Jose. Also since leaving Apple, Wozniak has provided all the money, as well as a good amount of on-site technical support, for the technology program in his local school district in Los Gatos. Un.U.Son. (Unite Us In Song), an organization Wozniak formed to organize the two US festivals, is now primarily tasked with supporting his educational and philanthropic projects. 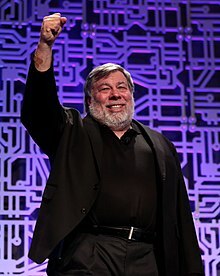 In 1986, Wozniak lent his name to the Stephen G. Wozniak Achievement Awards (popularly known as "Wozzie Awards"), which he presented to six Bay Area high school and college students for their innovative use of computers in the fields of business, art and music. Wozniak was the subject of a student-made film production of his friend's (Joe Patane) nonprofit Dream Camp Foundation for high-level need youth titled Camp Woz: The Admirable Lunacy of Philanthropy. In 1979, Wozniak was awarded the ACM Grace Murray Hopper Award. In 1985, he received the National Medal of Technology (with Steve Jobs) from US President Ronald Reagan. In December 1989, he received an honorary Doctor of Engineering degree from the University of Colorado Boulder. Later he donated funds to create the "Woz Lab" at the University of Colorado at Boulder. In 1998, he was named a Fellow of the Computer History Museum "for co-founding Apple Computer and inventing the Apple I personal computer." The city of San Jose named a street "Woz Way" in his honor. On February 17, 2014, in Los Angeles, Wozniak was awarded the 66th Hoover Medal from IEEE President & CEO J. Roberto de Marca. The award is presented to an engineer whose professional achievements and personal endeavors have advanced the well-being of humankind and is administered by a board representing five engineering organizations: The American Society of Mechanical Engineers; the American Society of Civil Engineers; the American Institute of Chemical Engineers; the American Institute of Mining, Metallurgical, and Petroleum Engineers; and Institute of Electrical and Electronics Engineers. The New York City Chapter of Young Presidents' Organization presented their 2014 Lifetime Achievement Award to Wozniak on October 16, 2014 at the American Museum of Natural History. In November 2014, Industry Week added Wozniak to the Manufacturing Hall of Fame. On June 19, 2015, Wozniak received the Legacy for Children Award from the Children's Discovery Museum of San Jose. The Legacy for Children Award honors an individual whose legacy has significantly benefited the learning and lives of children. The purpose of the Award is to focus Silicon Valley's attention on the needs of our children, encouraging us all to take responsibility for their well-being. Candidates are nominated by a committee of notable community members involved in children's education, health care, human and social services, and the arts. The street address of the Children's Discovery Museum of San Jose is 180 Woz Way. On June 20, 2015, The Cal Alumni Association (UC Berkeley's Alumni Association) presented Wozniak with the 2015 Alumnus of the Year Award. "We are honored to recognize Steve Wozniak with CAA’s most esteemed award," said CAA President Cynthia So Schroeder '91. "His invaluable contributions to education and to UC Berkeley place him among Cal's most accomplished and respected alumni." In March 2016, High Point University announced that Wozniak will serve as their Innovator in Residence. Wozniak was High Point University’s commencement speaker in 2013. Through this ongoing partnership, Wozniak will connect with High Point University students on a variety of topics and make campus-visits periodically. In March 2017, Wozniak was listed by UK-based company Richtopia at number 18 in the list of 200 Most Influential Philanthropists and Social Entrepreneurs. In 2018 Wozniak won the "Human of the Year Award" at The Human Project Summit. The award highlighted the work of the Inspiring Children Foundation and the children and leaders in the program. He nominated Ryan Wolfington, founder of the program, to receive the award with him. Foundation Executive Director Trent Alenik and mentor program leader Cherrial Odell accepted the award with Wozniak on behalf of Wolfington and the Foundation. On November 13, 2018, Wozniak received the CME Group Melamed-Arditti Innovation Award. This award honors an individual or group of individuals whose innovative ideas, products or services have created significant change to markets, commerce or trade. Steve Wozniak has been mentioned, represented, or interviewed many times in media. The Secret History of Hacking – a 2001 documentary film featuring Wozniak. Triumph of the Nerds – a 1996 PBS documentary series about the rise of the personal computer. 1999: Pirates of Silicon Valley – a TNT film directed by Martyn Burke. Wozniak is portrayed by Joey Slotnick while Jobs is played by Noah Wyle. 2013: Jobs – a film directed by Joshua Michael Stern. Wozniak is portrayed by Josh Gad, while Jobs is portrayed by Ashton Kutcher. 2015: Steve Jobs – a feature film by Danny Boyle, with a screenplay written by Aaron Sorkin. Wozniak is portrayed by Seth Rogen, while Jobs is portrayed by Michael Fassbender. 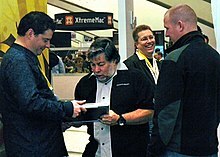 Wozniak portrays a parody of himself in the first episode of the television series Code Monkeys; he plays the owner of Gameavision before selling it to help fund Apple. He later appears again in the twelfth episode when he is in Las Vegas at the annual Video Game Convention and sees Dave and Jerry. He also appears in a parody of the "Get a Mac" ads featured in the final episode of Code Monkeys second season. Wozniak is also interviewed and featured in the documentary Hackers Wanted and on the BBC. Wozniak competed on Season 8 of Dancing with the Stars in 2009 where he danced with Karina Smirnoff. Though Wozniak and Smirnoff received 10 combined points from the three judges out of 30, the lowest score of the evening, he remained in the competition. He later posted on a social networking site that he believed that the vote count was not legitimate and suggested that the Dancing with the Stars judges had lied about the vote count to keep him on the show. After being briefed on the method of judging and vote counting, he retracted and apologized for his statements. Though suffering a pulled hamstring and a fracture in his foot, Wozniak continued to compete, but was eliminated from the competition on March 31, with a score of 12 out of 30 for an Argentine Tango. On September 30, 2010, he appeared as himself on The Big Bang Theory season 4 episode "The Cruciferous Vegetable Amplification". While dining in The Cheesecake Factory where Penny works, he is approached by Sheldon via telepresence on a Texai robot. Leonard tries to explain to Penny who Wozniak is, but she says she already knows him from Dancing with the Stars. On September 30, 2013, he appeared along with early Apple employees Daniel Kottke and Andy Hertzfeld on the television show John Wants Answers to discuss the movie Jobs. Wozniak lives in Los Gatos, California. He applied for Australian citizenship in 2012, and has stated that he would like to live in Melbourne, Australia in the future. Wozniak has been referred to frequently by the nickname "Woz", or "The Woz"; he has also been called "The Wonderful Wizard of Woz" and "The Second Steve" (in regard to his early business partner and longtime friend, Steve Jobs). "WoZ" (short for "Wheels of Zeus") is the name of a company Wozniak founded in 2002. Wozniak describes his impetus for joining the Freemasons in 1979 as being able to spend more time with his then-wife, Alice Robertson, who belonged to the Order of the Eastern Star, associated with the Masons. Wozniak has said that he quickly rose to a third degree Freemason because, whatever he does, he tries to do well. He was initiated in 1979 at Charity Lodge No. 362 in Campbell, California, now part of Mt. Moriah Lodge No. 292 in Los Gatos. Today he is no longer involved: "I did become a Freemason and know what it's about but it doesn't really fit my tech/geek personality. Still, I can be polite to others from other walks of life. After our divorce was filed I never attended again but I did contribute enough for a lifetime membership." Wozniak was married to slalom canoe gold-medalist Candice Clark from June 1981 to 1987. They have three children together, the youngest being born after their divorce was finalized. 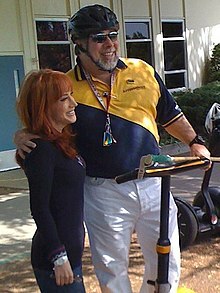 After a high-profile relationship with actress Kathy Griffin, who described him on Tom Green's House Tonight in 2008 as "the biggest techno-nerd in the Universe", Wozniak married Janet Hill, his current spouse. On his religious views, Wozniak has called himself an "atheist or agnostic". In 2006, he co-authored with Gina Smith his autobiography, iWoz: From Computer Geek to Cult Icon: How I Invented the Personal Computer, Co-Founded Apple, and Had Fun Doing It. The book made The New York Times Best Seller list. Wozniak's favorite video game is Tetris for Game Boy, and he had a high score for Sabotage. In the 1990s he submitted so many high scores for Tetris to Nintendo Power that they would no longer print his scores, so he started sending them in under the alphabetically reversed name "Evets Kainzow". Prior to the release of Game Boy, Wozniak called Gran Trak 10 his "favorite game ever" and said that he played the arcade while developing hardware for the first version of Breakout for Atari. (pp103–104) In 1985, Steve Jobs referred to Wozniak as a Gran Trak 10 "addict". In March 2015, Wozniak stated that while he had originally dismissed the writings of Ray Kurzweil who stated machine intelligence will outpace human intelligence within several decades, Wozniak had come to change his mind: "I agree that the future is scary and very bad for people. If we build these devices to take care of everything for us, eventually they'll think faster than us and they'll get rid of the slow humans to run companies more efficiently." Wozniak stated that he had started to identify a contradictory sense of foreboding about artificial intelligence, while still supporting the advance of technology. ^ a b c d e f g h i j k l m n o p q r s Wozniak, Steve; Smith, Gina (2006). iWoz: Computer Geek to Cult Icon: How I Invented the Personal Computer, Co-Founded Apple, and Had Fun Doing It. W. W. Norton & Company. ISBN 0-393-06143-4. OCLC 502898652. ^ a b Dayal, Geeta (February 1, 2013). "Phreaks and Geeks". Slate. Retrieved November 22, 2017. ^ Stix, Harriet (May 14, 1986). "A UC Berkeley Degree Is Now the Apple of Steve Wozniak's Eye". Los Angeles Times. Retrieved November 22, 2017. ^ "Steve Jobs & Steve Wozniak". MIT. Lemelson Foundation. Retrieved November 22, 2017. ^ a b c d e f "About Steve Wozniak aka 'The Woz'". Woz.org. Retrieved March 19, 2017. ^ Martin, Emmie (April 21, 2017). "Why Apple co-founder Steve Wozniak doesn't trust money". ^ a b "This Week in Apple History – June 7–13: The Woz Marries, Switcher Campaign Starts, IE Ended". The Mac Observer. June 13, 2004. Retrieved November 28, 2012. ^ a b "Wizard of Woz". People.com. Retrieved April 9, 2018. ^ "Steve Wozniak". biography. biography.com. Retrieved July 4, 2016. ^ Rebecca Gold (1994). Steve Wozniak: A Wizard Called Woz. Lerner. ^ a b Linzmayer, Owen W. (2004). Apple confidential 2.0 : the definitive history of the world's most colorful company (Rev. 2nd ed.). San Francisco, Calif.: No Starch Press. ISBN 1-59327-010-0. ^ Reimer, Jeremy (December 14, 2005). "Total share: 30 years of personal computer market share figures". Ars Technica. Retrieved May 22, 2017. ^ "Nolan Bushnell Appointed to Atari Board — AtariAge Forums — Page 30". Atariage.com. April 29, 2010. Retrieved November 11, 2010. ^ a b c "Steve Wozniak on Newton, Tesla, and why the original Macintosh was a 'lousy' product". The Verge. Archived from the original on March 12, 2016. Retrieved June 28, 2013. ^ a b c d "I Never Left Apple". Officially Woz. January 3, 2018. Retrieved October 2, 2018. ^ a b Wozniak, Steve. "About your last name". Woz.org. Retrieved November 22, 2017. ^ "Завжди знав, що маю українське прізвище: співзасновник Apple Возняк відвідав Київ" (video). TSN 19:30. Kiev: 1+1. September 30, 2017. Retrieved December 12, 2017. This is a very special visit for us. I was always aware that my name was Ukrainian. Report in Ukrainian, but part of Wozniak speaking in English can be heard behind the translation. ^ Lapsley, Phil (February 16, 2013). "From "phreaks" to Apple: Steve Jobs and Steve Wozniak's "eureka!" moment". Salon.com. Retrieved March 22, 2013. ^ Huffingtonpost interview. Retrieved on April 22, 2017. ^ a b "CU breeds success: A look at famous alumni". CU Independent. February 20, 2007. Retrieved February 11, 2016. ^ "From the Chancellor - Office of the Chancellor". University of Colorado Boulder. Retrieved February 27, 2017. ^ "Cream soda – The first computer". emberify.com. October 1, 2014. Retrieved February 27, 2017. ^ "Steve Wozniak Talks About HP". YouTube. Retrieved November 22, 2017. ^ a b "Three Minutes With Steve Wozniak". ABC News. July 20, 2007. Retrieved November 10, 2013. ^ Young, Jefferey S. (December 1988). Steve Jobs: The Journey is the Reward. Lynx Books. ISBN 155802378X. ^ "An exclusive interview with Daniel Kottke". India Today. September 13, 2011. Archived from the original on March 4, 2016. Retrieved October 27, 2011. "Classic Gaming: A Complete History of Breakout". GameSpy. Archived from the original on July 8, 2012. Retrieved April 19, 2010. ^ a b Isaacson, Walter (2011). Steve Jobs. New York, NY: Simon & Schuster. ISBN 978-1-4516-4853-9. ^ a b Freiberger, Paul; Swaine, Michael (2000). Fire in the Valley. McGraw-Hill. ISBN 0-07-135892-7. ^ "Apple co-founder offered first computer design to HP 5 times". AppleInsider. ^ "How Did Apple Computer Get Its Brand Name?". Branding Strategy Insider. November 17, 2011. Retrieved December 25, 2017. ^ "Woz: Putting Color In The Computer Was One Of The Biggest Things Apple Ever Did". macstories.net. ^ Schawbel, Dan. "Steve Wozniak: His Career Challenges, Steve Jobs, Tech Trends and Advice". Forbes. ^ a b c Williams, Gregg; Moore, Rob (January 1985). "The Apple Story / Part 2: More History and the Apple III". BYTE (interview). p. 166. Retrieved October 26, 2013. ^ Tirrell, Rick (2009). The wisdom of resilience builders : how our best leaders create the world's most enduring enterprises. Bloomington, IN: AuthorHouse. p. 236. ISBN 1-4490-5323-8. ^ O'Grady, Jason D. (2009). Apple Inc. Westport, Conn.: Greenwood Press. p. 27. ISBN 0-313-36244-0. ^ "Us Festival: More Music, Money and Madness". Rolling Stone (397): 42–45. June 9, 1983. ^ a b Flatow, Ira. Present at the Future: From Evolution to Nanotechnology, Candid and Controversial Conversations on Science and Nature. USA: HarperCollins, 2007. 263-4. Print. ^ a b Rice, Valerie (April 15, 1985). "Unrecognized Apple II Employees Exit". InfoWorld. p. 35. Retrieved February 4, 2015. ^ Glancer, David (August 26, 2016). "Interview: Steve Wozniak, Apple co-founder and inventor of the home computer". The Conversation. Retrieved May 17, 2017. ^ Costello, Sam (January 24, 2002). "Apple co-founder turns the Wheels of Zeus". CNN. Retrieved October 19, 2017. ^ Vance, Ashlee (February 4, 2009). "Wozniak Accepts Post at a Storage Start-Up". The New York Times. Retrieved September 28, 2016. ^ Preimesberger, Chris (November 19, 2014). "The Band's Back Together: Woz Joins Startup Primary Data". eWeek. Retrieved September 28, 2016. ^ Krishnamoorthy, Anand; Li, Susan. "Jobs's Death Was Like Lennon, JFK Getting Shot, Wozniak Says". Bloomberg Businessweek. Retrieved March 25, 2015. ^ Peterson, Kim (April 16, 2006). "Steve Wozniak Q & A". The Seattle Times. Retrieved March 22, 2013. ^ "Silicon Valley Comic Con WOZ Welcome Address, published on YouTube". Retrieved May 2, 2016. ^ "Silicon Valley Comic Con 2016, published on YouTube". Retrieved March 20, 2019. ^ US Patent No. 4,136,359, US Patent & Trademark Office, Patent Full Text and Image Database. ^ Controller for magnetic disc, recorder, or the like US Patent 4210959, US Patent & Trademark Office, Patent Full Text and Image Database. ^ Apparatus for digitally controlling PAL color display US Patent 4217604, US Patent & Trademark Office, Patent Full Text and Image Database. ^ Digitally-controlled color signal generation means for use with display US Patent 4278972, US Patent & Trademark Office, Patent Full Text and Image Database. ^ a b John Perry Barlow (November 8, 1990). "A Not Terribly Brief History of the Electronic Frontier Foundation". Archived from the original on June 27, 2001. Retrieved December 28, 2015. ^ "Formation documents and mission statement for the EFF". Archived from the original on December 4, 2015. Retrieved December 28, 2015. ^ Mike Saunders (July 3, 2013). "Inside the Electronic Frontier Foundation". TuxRadar.com. Retrieved December 28, 2015. ^ Seibold, Chris. "This Day in Apple History December 28, 1989: Woz Gets Honorary Doctorate, Dish Incident Forgotten". Retrieved July 31, 2007. ^ "Steve Wozniak — CHM Fellow Award Winner". Computer History Museum. Retrieved March 30, 2015. ^ "The Heinz Awards, Steve Wozniak profile". Heinzawards.net. Retrieved November 11, 2010. ^ a b Honorary Doctorate — North Carolina State University List of Honorary Degrees. ^ "Commencement | MSU Commencement". Commencement.msu.edu. Retrieved March 22, 2013. ^ "Global Award of the President of Armenia for Outstanding Contribution to Humanity Through IT". Globalitaward.am. Archived from the original on December 1, 2012. Retrieved March 22, 2013. ^ "2014 Hall of Fame Inductee: Steve Wozniak". IndustryWeek. 2014-11-03. Retrieved 2019-03-06. ^ "Legacy for Children Award". Children’s Discovery Museum of San Jose. ^ "CAA Announces the 2015 Alumnus of the Year Steve Wozniak, B.S. '86 and Other Alumni Award Recipients". Cal Alumni Association. ^ Baker, Eli (March 7, 2016). "Apple Co-Founder Steve Wozniak Becomes Innovator in Residence, High Point University". High Point University. Retrieved November 22, 2017. ^ Marketwired (February 21, 2017). "Apple Co-Founder Steve Wozniak Holds Micro Sessions with HPU Students". Yahoo! Finance. Retrieved November 22, 2017. ^ "Philanthropists & Social Entrepreneurs Top 200: From Elon Musk to Melinda Gates, These Are the Most Influential Do-Gooders in the World". Richtopia. Retrieved March 29, 2017. ^ "Top 200 Philanthropists in the world". Delfi. Retrieved March 31, 2017. ^ "Ryan Wolfington". Marty Hennessy Inspiring Children Foundation. ^ "Commencement Coverage". Kettering University. Retrieved February 11, 2016. ^ "NSU Commencement Programs". Nova Southeastern University. Retrieved April 9, 2017. ^ "Steve Wozniak Speaker Profile". Speakers Associates. Retrieved April 9, 2017. ^ "Honorary degree citation -Steve Wozniak". Concordia University. Retrieved February 9, 2016. ^ "Steve Wozniak Awarded Honorary Doctoral Degree - Hetq - News, Articles, Investigations". hetq.am. Retrieved February 27, 2017. ^ "June 2012 - 2012 - Press Releases - News & Events - Santa Clara University". Santa Clara University. Retrieved February 11, 2016. ^ "Honorary Doctorates - Universidad Camilo José Cela". Universidad Camilo José Cela. Retrieved March 22, 2016. ^ "Steve Wozniak's Formative Moment". Reddit. March 15, 2016. Retrieved February 27, 2017 – via YouTube. ^ "American Genius". American Genius. Archived from the original on September 10, 2015. ^ Collins, Michelle. "VH1 Best Week Ever — Off The Market: Kathy Griffin Finds a New Man!". Archived from the original on August 20, 2007. Retrieved September 18, 2007. ^ "Apple co-founder Steve Wozniak to compete on 'Dancing With the Stars'" from Los Angeles Times. Retrieved on February 8, 2009. ^ "Why Apple founders got 'fired up.'". BBC News. November 21, 2008. Retrieved February 5, 2009. ^ Matyszczyk, Chris (March 17, 2009). "Woz in ABC 'outright lie' accusation". CNET. ^ Fashingbauer Cooper, Gael (March 19, 2009). "Wozniak sorry he called 'Dancing' show 'fake'". MSNBC. ^ Injured Woz Will Perform Archived March 25, 2009, at the Wayback Machine People, March 23, 2009. ^ Woz Gets Hipchecked Off the Dance Floor, by Kara Swisher, April 1, 2009, All Things Digital. ^ Hopewell, Luke (September 25, 2012). "Steve Wozniak Is Becoming An Australian Citizen". Gizmodo. Retrieved June 12, 2014. ^ Mulligan, Sean. "Steve "The Woz" Wozniak: 2011 Isaac Asimoz Science Award". American Humanist Association. Archived from the original on September 13, 2012. Retrieved May 13, 2012. ^ "A Few Famous Masons". Grand Lodge of British Columbia and the Yukon. Retrieved March 25, 2013. ^ "Ask Steve Wozniak Anything". Slashdot. October 1, 2012. Retrieved October 25, 2018. ^ "'I'm in trouble' says Woz's wife". Fortune. Retrieved February 27, 2017. ^ Wozniak, Steve (2002). "Letters-General Questions Answered". Woz.org. Los Gatos, California. Archived from the original on April 23, 2016. Retrieved November 22, 2017. I am also atheist or agnostic (I don't even know the difference). I've never been to church and prefer to think for myself. I do believe that religions stand for good things, and that if you make irrational sacrifices for a religion, then everyone can tell that your religion is important to you and can trust that your most important inner faiths are strong. ^ "Woz and I agree: 'Tetris' for the Gameboy is the best game ever, by Daniel Terdiman, December 11, 2007, Geek Gestalt on CNET News. ^ "High Scores". Softline. September 1981. p. 28. Retrieved July 13, 2014. ^ Wozniak, Steve. "Evets Kainzow". Woz.org. ^ Edwards, Benj (May 4, 2007). "Woz Was Here - Steve Wozniak On His Gaming Past". Gamasutra. ^ Murphy, Conor (May 30, 2012). "The History of Breakout". Big Fish Games. ^ Kelion, Leo (September 9, 2015). "Steve Wozniak: Shocked and amazed by Steve Jobs movie". BBC. Retrieved September 9, 2015. ^ Holley, Peter (March 24, 2015). "Apple co-founder on artificial intelligence: 'The future is scary and very bad for people'". Washington Post. Retrieved January 7, 2018. ^ Gibbs, Samuel (June 25, 2015). "Apple co-founder Steve Wozniak says humans will be robots' pets". The Guardian. Retrieved January 7, 2018. ^ Dowd, Maureen (April 2017). "Elon Musk's Billion-Dollar Crusade to Stop the A.I. Apocalypse". Vanity Fair. Retrieved January 7, 2018. ^ "Apple cofounder Steve Wozniak dismisses AI concerns raised by Stephen Hawking and Nick Bostrom". Business Insider. October 9, 2016. Retrieved January 7, 2018. ^ Stockton, Nick (April 19, 2017). "How Steve Wozniak Got Over His Fear of Robots Turning People Into Pets". Wired. Retrieved January 7, 2018. ^ "Elon Musk says AI could doom human civilization. Zuckerberg disagrees. Who's right?". USA Today. January 2, 2018. Retrieved January 7, 2018.